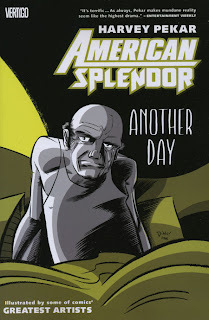 But criticisms like this miss the point of these two volumes and of The American Splendor Project in general. First of all, American Splendor was never a thrill-a-minute cavalcade of laughs and tears, even in its “file-clerkin’/getting pilloried by David Letterman/going through a succession of romantic failures” heyday. It was always dull. That was kind of the point. And the hit-to-miss ratio has at least improved since the early-90s Dark Horse era of the book, which contained far too many lectures about jazz for anyone’s RDA. The second attraction of the book was/is its dare to the revolving door of artists: “hey, make this schlubby guy and his misadventures visually interesting!” And in that regard, the DC/Vertigo volumes trump nearly anything done in American Splendor before (excepting of course R. Crumb’s seminal work on the book). In Another Day (reprinting DC/Vertigo’s first four-issue mini), we’ve got Ty Templeton, Eddie Campbell, Chris Weston (never been a huge fan, but his two-tone art sells me), and Gilbert Hernandez, as well as Pekar standbys Dean Haspiel, Greg Budgett and Gary Dumm. Recurring themes throughout the book are Pekar’s interactions with sales clerks, difficulties getting/taking medications and the everyman’s struggle with that most essential and infernal of household fixtures, the flush toilet. Another Dollar (reprinting “Season Two,” another four-issue mini) sees a greater continuity between issues, as our hero injures his arm in #1 and struggles with this latest health crisis through subsequent issues. He is aided by some returning artists from the previous series, as well as Darwyn Cooke, Warren Pleece and Sean Murphy. David Lapham illustrates what is perhaps the funniest post-movie-era Splendor story, in which a neighbourhood teenage pseudo-fan awkwardly drops by the Pekar residence to ask our hero advice on how to break into film – during which Harvey gets so bored, he gets up to grab himself a drink of juice, abandoning the kid on the front porch for a spell. And speaking of artists whose work is pleasantly surprising in black-and-white, Darick Robertson, who has always seemed to lack focus on Transmetropolitan and The Boys completely wins me over here. I’m guessing that doing a real-world story forced Robertson to reign in his tendency for over-the-top reaction shots which makes it a lot easier to admire his finely detailed, expressive and humane depiction of a Pekar faced with a broken-down car and the receptionist who proves his only ally against this crisis. In a comic where Pekar tries to come to grips with a reviewer who praises his comic but trashes its author, illustrator Chris Samnee reminds me of the early work of Stuart Immonen, which probably shouldn’t work, but does, terrifically – every ambivalent line on Pekar’s face is hilarious. Harvey Pekar is a survivor – of failed relationships, of financial hardships, of a go-nowhere job, of cancer fergawdsake – all of which were chronicled wonderfully in decades’ worth of comics as well as in the filmed adaptation of said comics. The movie may have provided some validation to The American Splendor Project – the damaged-but-not-broken everyman putting his life on display for any who care to look, and thereby exalting that life – but it didn’t end it. Pekar’s journey to the finish line continues, financial success and retirement from civil service be damned, and these volumes do a superb job of capturing that journey and presenting it for any who care to follow him. And in case you were still wondering, he liked the cookies.